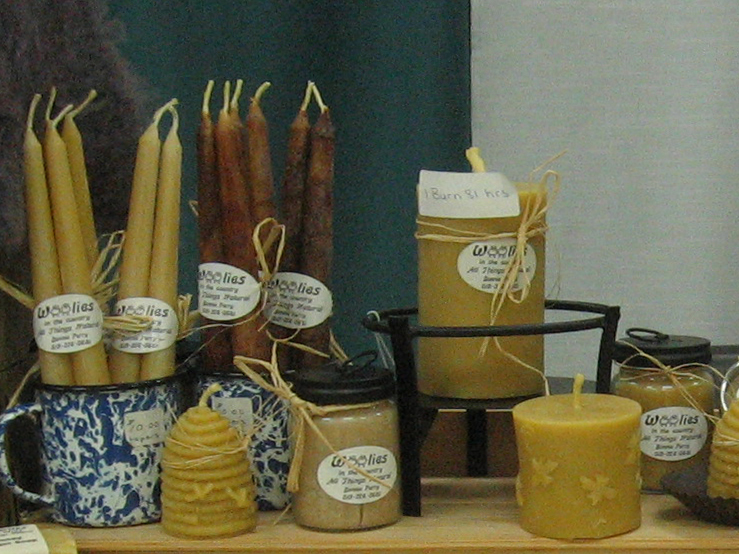 All beeswax candles are made from 100% pure Ontario beeswax. Each candle uses cotton wicks. Cinnamon candles have been painted with cinnamon on the outside of the candle only. Beeswax is naturally aromatic, non-toxic, non-allergenic and long burning. 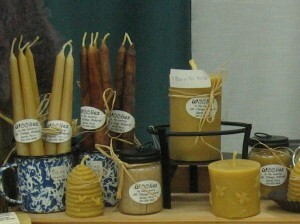 Beeswax is produced by the worker honeybee. For every 8 to 10 pounds of honey that bees produce, about one pound of beeswax is produced. When beeswax candles burn the positive and negative ions in the air are balanced making you feel better. As beeswax candles age you may notice a white film called “bloom” creating a frosty appearance. Bloom has no ill effect on the candle and is a sign of the purity of the beeswax. If you dislike the look, bloom may be removed with a soft cloth or by warming the candle.